Thanks to @BrianKearney95 for sending this to us. 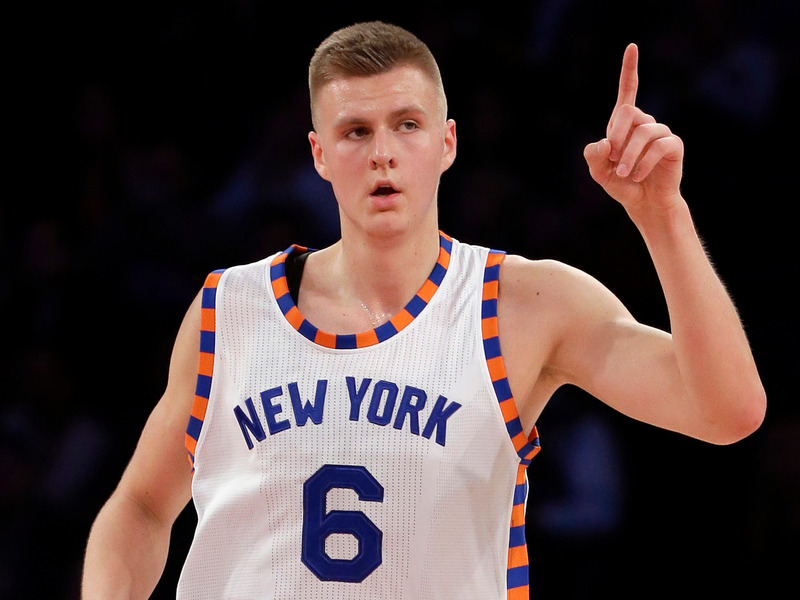 All’s we can say is we strongly urged James Dolan to listen to the other Sharks before accepting Mark Cuban’s offer for 7’3″ Kristaps Porzingis. Barbara Corcoran wouldn’t have offered more? Mr. Wonderful? Daymond John? Lori the QVC lady? Robert with the good hair? No one? Maybe if New York wasn’t a small-market town…anyway, now international player-adoring owner Cuban has Porzingis and likely Rookie of the Year Luka Doncic: i.e., his best pair of foreign-born players since Nash and Nowitzki. In Thailand, Khemjira Klongsanun was seven miles into the Chombueng Marathon when she noticed runners ahead of her dodging an object in the road. It was a lost puppy, and as there were no homes nearby, Klongsanun figured it had been abandoned. She picked up the pup and carried it the last 19 miles across the finish line. 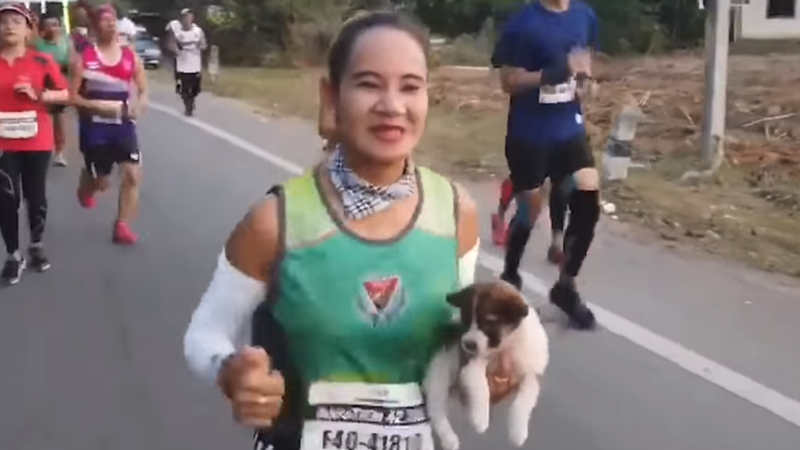 After the race Klongsanum repeatedly appealed for the pup’s owner to come forward, but no one ever did. And so she adopted him and named him Chombueng. She’s our early leader for Sportsperson of the Year. Jordan McNair. Remember when it was supposed to be about him? All of the committee members charged the school at an hourly rate of $650, which is like partner-level at Skadden, Arps. Or should at least come with bottle service. Now, we think we know what’s happening here (not that it makes it any less obscene). 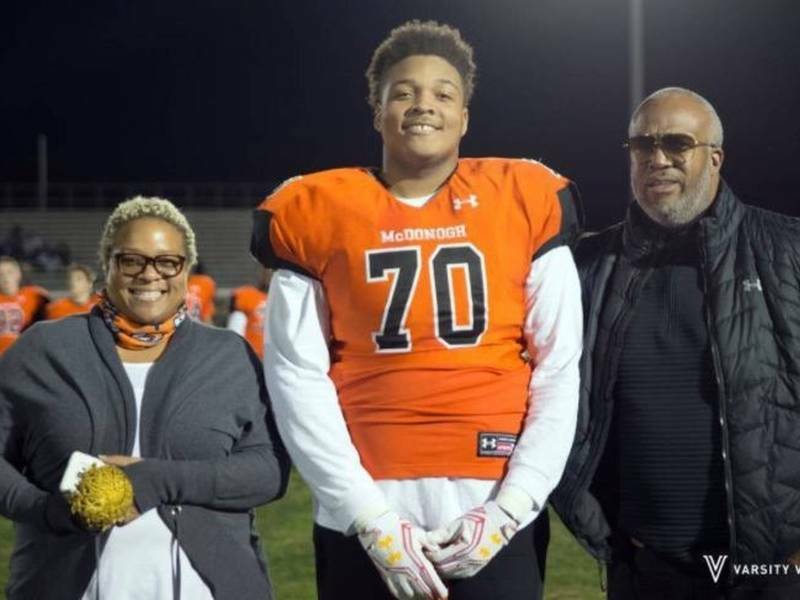 Maryland was paying for the work to a degree, but what the school was really paying for was insurance against the lawsuit they expected head coach D.J. Durkin to file once they terminated him. If they had simply done what common sense tells you to do (fire the jerk), his wrongful termination suit might have heft. So, yeah, it’s crazy obscene that Bernstein and McMillen would charge their own alma mater $650 an hour for a fait accompli , but it’s good work if you can get it. We’re just wondering why Terp alum Susie B. was not onboard this gravy train. Related: We know and like Bernstein. Consider her a friend. But you know, we’re also journalists and we report on the news. Look around and see how many folks in the sports sphere call attention to this fleecing. Will fellow Terp alum Scott Van Pelt mention it on SportsCenter? Would seem to be the story that would normally be right in his wheelhouse. Last night we stayed up late to watch Singin’ In The Rain on TCM because 1) we’d never seen it and 2) it’s not as if we had to wake up early to go to work and 3) we’re that rare straight guy who owns a cat and enjoys musicals. Whaddaya want from us? Anyway, afterward TCM host Ben Mankiewicz noted how the Gene Kelly-Donald O’Connor-Debbie Reynolds-Cyd Charisse classic was pretty much overlooked upon release in 1952 (one cast member was nominated for a Best Supporting Actress Oscar, but it was none of them; it was Jean Hagen) and didn’t even make prominent Top 10 films of the year lists at the time. Now, as Ben noted it’s on the American Film Institute’s Top 100 Films list. In fact, it’s in the TOP TEN. The folks at AFI finally got smart and realized that many movie fans check out this list and count how many of the movies they’ve seen, so when we returned to the list late last night (actually, this morning…“Good mornin’, good mornin’, we’ve talked the whole night through…”) we smiled at its new wrinkle: you can check a box next to the movies you’ve seen and it will do the counting for you. Wondering if John C. Reilly and Jenna Fischer got hate mail from Joaquin Phoenix and Reese Witherspoon after Walk Hard: The Dewey Cox Story was released. As Rolling Stone opined last December, this genius parody nearly killed the music biopic. It came out only two years after Walk The Line and had to be inspired by it, nearly plot point for plot point. WAIT, WAIT, WAIT! If I wasn’t already sitting, I’d be reaching for a chair – you’d NEVER seen “Singing In The Rain” before last night? A guy who watches TCM even more than I do? WHAT?! A movie annually voted one of the “best” movie musicals of ALL TIME ?! How is that POSSIBLE?! Does Katie know this? That she still considers you a friend just shows she’s even more magnanimous than previously thought. 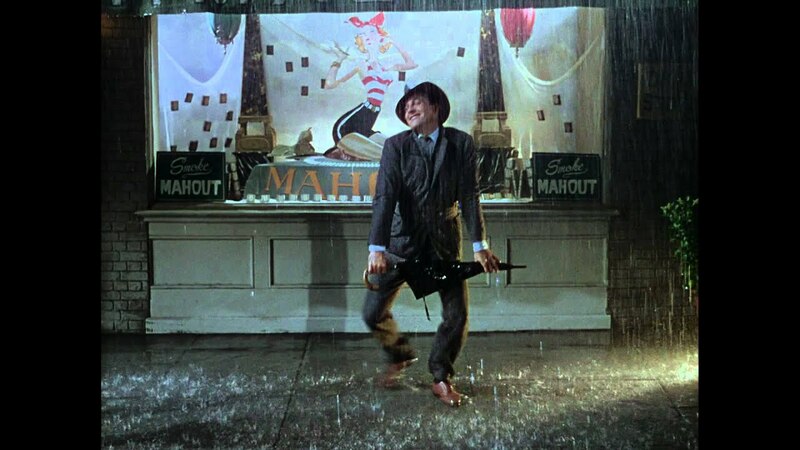 On the other hand, Katie – how could you let one of your best friends go thru life (at least till AARP-qualified) without having to share the urge with all other Americans to sing/dance with an umbrella almost every time it rains thanks to this American classic? And just think – AFTER that $1.57 MILLION “report”, the board voted to KEEP Durkin. LOL! Don’t blame me, I’ve been livid with my alma mater since they left the ACC! Just to clarify, Susie B., I’d seen most if not all of the musical numbers via “That’s Entertainment” or other ways. I’d just never seen the film start to finish. Also, as part of a Thursday two-fer (that’s not alliterative, I know), I watched the 1937 “A Star Is Born” for the first time. Who knew (I didn’t) that it had such a witty screenplay (“How do I send a congratulatory telegram to the Pacific Ocean?”). Great stuff. Also, is it just me or did Fredric March in that role remind you a little of Charlie Sheen? Finally, because you are probably wondering, sold almost all of my AMZN at $1730 late yesterday afternoon. Almost all. But not all. Will jump in again on the next down cycle. Almost forgot – I realize I’ve been out of the NBA “loop” this season so haven’t kept up with the “news” & other rumors, but do you think Durant will really leave the Super Villains & join the Knicks?! And that Flat Earther Irving will, ahem, throw that tea overboard & join him?! If I hadn’t just read your movie revelation/confession, THIS would have shocked me the most today. Which do you think more likely : Anthony Davis joining the Lakers BEFORE 2020 or KD as a Knick next year? Billing rates for Skadden partners are at least double that.